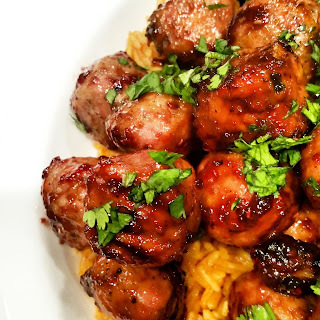 Savory chicken meatballs that are crisp on the outside and tender on the inside, smothered in a sweet and spicy glaze, atop a bed of gloriously golden saffron rice. Attractive and tasty! Combine the ground chicken, bacon fat (or oil), panko, egg, salt, and pepper in a bowl. Mix well taking care not to over work the mixture or you will have tough meatballs. Shape the mixture into balls that are about 1 inch in diameter. I used a cookie scoop so that my meatballs would all be the same size since I am lousy at uniformity by hand. Bake at 350°F on a sheet tray for about 30 minutes. I cut one open to make sure they were cooked through. At this point you can refrigerate these for future use or use them right away. When ready to use, transfer the meatballs to a skillet, add the raspberry chipotle sauce, heat through and allow the sauce to reduce slightly. Bring the chicken broth to a boil in a large pot then add a pinch of saffron (somewhere in the neighborhood of 5 strands). Swirl the broth until the saffron has deepened the golden color of the broth. Add the rice and butter, cover, and bring back to a boil. Reduce the heat to low and let simmer until the liquid is absorbed (about 15 min). Do not remove the lid until the rice is fully cooked. Fluff with a fork. Top the rice with the saucy meatballs, sprinkle with chopped cilantro, and serve.